Some of you might know that I'm going through a bit of a YOGA phase. Addicted. I have an intense personality. And I constantly need new interests and challenges. So although I am LOVING yoga so much that I wanna swear this is it. I found my exercise soul-mate. I'm done searching. This. Is. It. I really don't know. I kind of felt that way about Zumba two years ago. And then biking. And then HIIT. And now yoga. But damn do I love it. Really really love it. I guess the point is that you need to keep searching for things you love doing to keep exercise a mainstay in your life. Don't try to force yourself to do something you no longer enjoy. Don't feel bad when you walk away from an activity. As long as you are walking towards something else. And there are so many things out there to try. Oh - if only I had more time. Although I am LOVING my yoga classes (I do all kinds from restorative/gentle to Ashtanga/Vinyasa Flow/Power), I guess I started to get a bit itchy to try something new. So yesterday I went completely out of my comfort zone and dropped in for an AcroYoga class.............OH. WHAT. FUN. Taking turns flying and being flown in the air by complete strangers. What an experience. Bucket list - check! 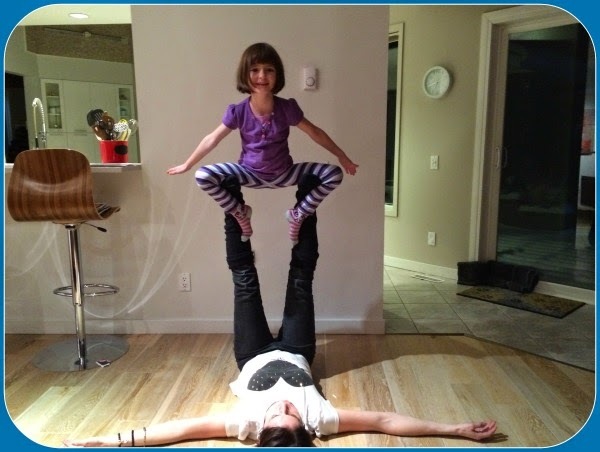 And tonight the kids and I did AcroYoga all night. Now my 5-year-old is completely addicted too. 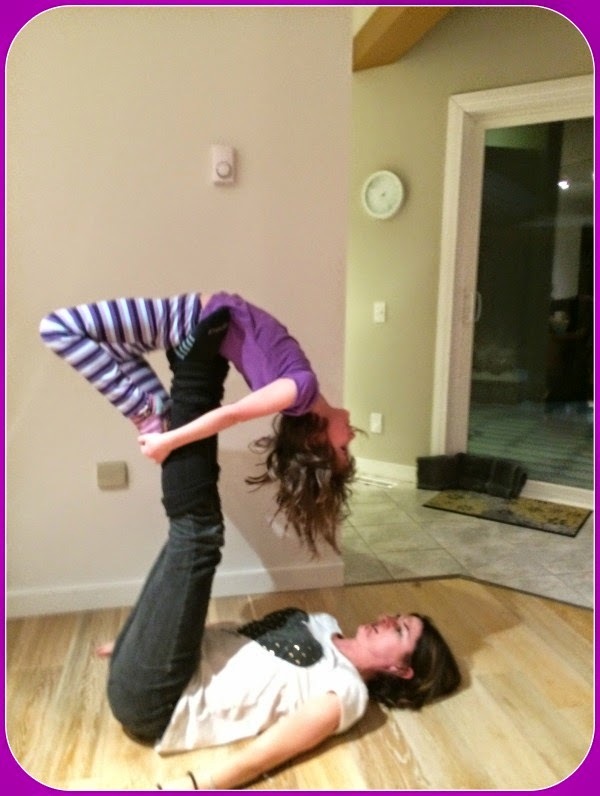 Her last words before bedtime were "Please mama, one more yoga". So I'm challenging all of you, if you are bored with your usual routine or just don't have a routine, go find something fun to do. I need someone to do this with me............hubby is athletically gifted by flexibility challenged. Now I have a partner to help me work on my scorpion. Much better company than the wall. A family affair. 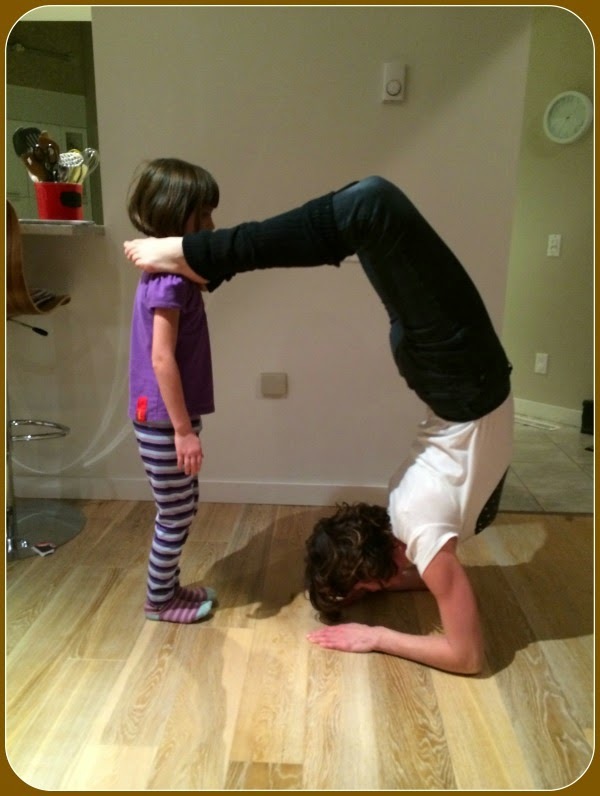 Still need to figure out how the little one can get involved in this pose. So far he just likes to stomp or sit on my face. 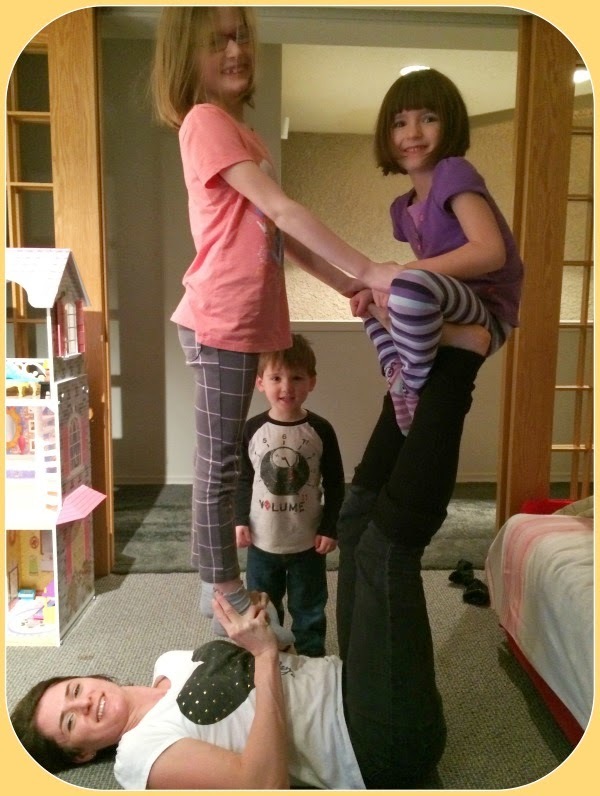 such a fun way to incorporate healthy lifestyle for the entire family as everyone likes to do all the weird poses especially the children its always a fun filled adventure.